Hi there. Did you just spot something called Pine Tree on your machine? 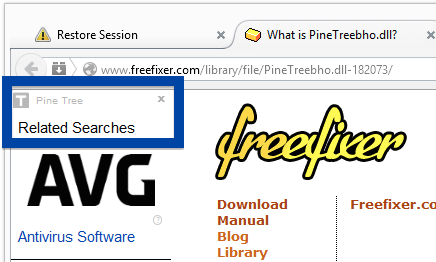 If the Pine Tree is installed on your machine, you’ll see Ads labeled “Pine Tree Ads” appearing in Firefox and Internet Explorer. 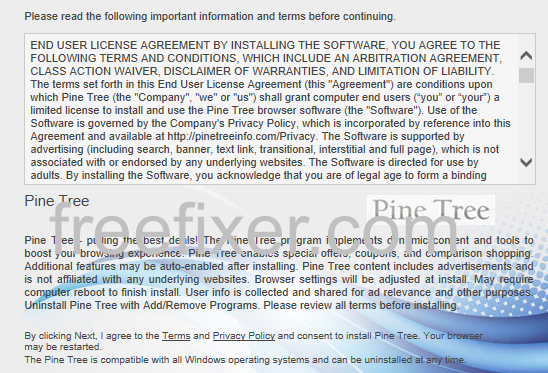 I’ll show how to remove PineTree in this blog post with the FreeFixer removal tool. Generally, you can avoid bundled software such as Pine Tree by being careful when installing software and declining the bundled offers in the installer. When I run into some new bundled software I always upload it to VirusTotal to check if the anti-virus software there detect something. 24 of the 56 scanners detected the file. The Pine Tree files are detected as a variant of Win32/BrowseFox.AE potentially unwanted by ESET-NOD32, Gen:Variant.Adware.Mikey by F-Secure, PUP.Optional.PineTree.A by Malwarebytes and Trojan.Win32.Yontoo.dnkubo by NANO-Antivirus. Hope that helped you to figure out how to do the removal. I stumbled upon Pine Tree while testing out some downloads that are known to bundled lots of unwanted software. Any idea how PineTree was installed on your machine? Please share in the comments below. Thank you very much! Thank you for reading and welcome back.